The chili was a success and here is a much better picture. If you want the recipe, click here. This is the first time I've eaten a white chili of any kind and I really liked it. 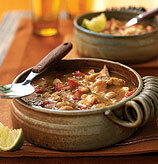 From what I hear, white bean and turkey chili is quite popular these days. Another chef was making it last night. BAM! Does anyone watch Top Chef? I'm hoping that Marcel leaves soon. His attitude and puffy hair are driving me crazy! Can't wait to see tonight!